2014, Dir. Katherine Knight and Marcia Connolly, 52 mins. This award-winning film documents a bold architecture project on remote Fogo Island, Newfoundland that embraces the excitement of living on the edge in relation to nature and contemporary design. A beautifully shot film that captures the stunning landscape and extraordinary architecture that makes up the project. Featuring Zita Cobb of the Shorefast Foundation and Todd Saunders, a Newfoundland-born, Norwegian based architect. 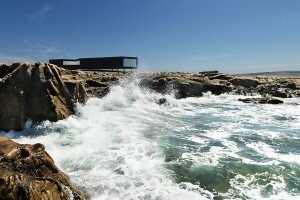 Architect Todd Saunders’ sculpture-like artist studios perched on the rocky shores of Fogo Island created a buzz among worldwide architecture fans when the first images were released. Since then, the four artists studios and the new Fogo Island Inn have been documented in more than 80 international magazines and blogs ranging from the New York Times Magazine, to fashion arbiter Wallpaper to architectural magazines such as Domus. Morocco is an ideal place for cinema production. Many great films have been setting here. Its film history includes many famous titles from historical dramas, like “Lawrence of Arabia”, to horror films like “The Hills Have Eyes”, through to the multiple award winner “Kundun”. The region in which these epics were shot still has the architectural and cultural remains of the film shoots. Petite Histoire des Plateaux Abandonnés gives us a look at this unstable representation of history, with its biological decay of “ancient ruins” and the ability of the local desert inhabitants to recite lines verbatim from the films. In this work these sets are used again with two local kids as actors. The two kids re-enact a few lines from movies that have been shot there, an American horror movie, Lawrence of Arabia… and all around nature and the uncontaminated landscapes of the Draa Valley stand outside of time. Sound designer Enrico Ascoli.